Tser Diamond with Adeline Grace. It’s pretty common to not be able to see one’s own flaws. 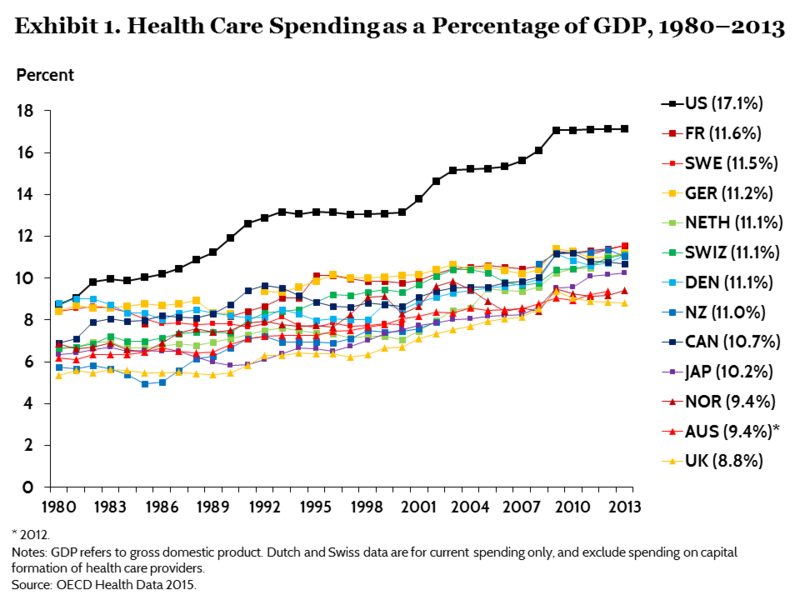 But when we look at the United States in comparison to other countries, a few things become clear: For one, the United States spends more money per capita on maternity care (and health care) than any other country. And two: the United States has the worst infant and maternal mortality rates than every other developed country in the world. Not only that, but our maternal mortality rate is increasing, whereas every other country’s rate is dropping. How can that be, you might wonder? The United States has the highest rate of maternal mortality in the industrialized world. Higher than 45 other nations to be precise, behind countries like Saudi Arabia and Kazakhstan. According to the CDC, 60 percent of these deaths are completely preventable. Every day, somewhere in the United States, two women die from pregnancy-related complications. Tser Diamond is one of 800 women who will die this year, within 42 days of birth. A gofundme to help support this grieving family. Women today are twice as likely to die from pregnancy-related complications, than their own mothers were. What are we doing differently? What are we doing wrong? Around the world, maternal mortality rates have been steadily falling, but the United States is the only developed country whose maternal mortality is steadily increasing. From 1979-1986 the US maternal death rate was 9.1 per 100,000 live births. Today, it’s over 26 deaths per 100,000 live births. “Global, regional, and national levels of maternal mortality, 1990–2015: a systematic analysis for the Global Burden of Disease Study 2015,” The Lancet. Only data for 1990, 2000 and 2015 was made available in the journal. The rate increased by 26.6% from 2000 to 2014. How has this increase been able to escalate unchecked? 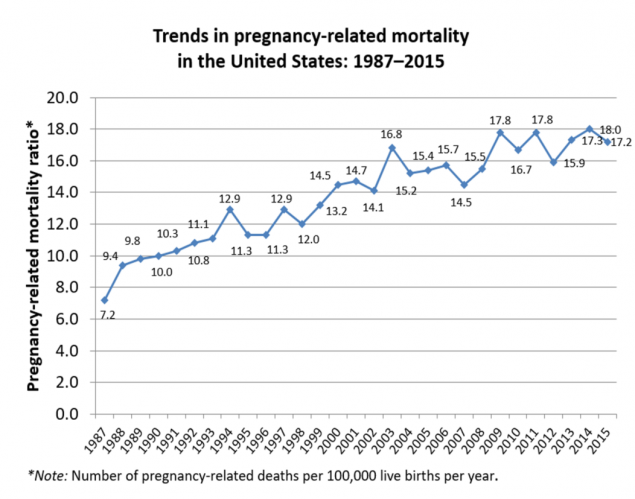 The CDC does not have an explanation for the overall increase in pregnancy-related mortality. Which does not surprise me. Change is hard. Admitting mistakes is harder. One things for sure: we are failing the mothers in our society. In the United States, about 32 percent of births are delivered via C-section, compared to countries like Finland (6.6%), the Netherlands (7.7%) and Norway (6.6%) whose lower C-section rates mirror their lower maternal mortality rate: 3, 7 and 5 deaths per 100,000 live births, respectively, compared to the United States’ 26 deaths per 100,000 live births. It makes sense, because c-sections have a higher rate of morbidities associated with labor and delivery—maternal transfusion, ruptured uterus, unplanned hysterectomy, and intensive care unit (ICU) admission. For example, a healthy woman who undergoes a low-risk elective cesarean delivery is 5 times more likely to experience cardiac arrest, 3 times more likely to have a hysterectomy, 3 times more likely to have major puerperal infection, and 2 times more likely to have anesthetic complications than a planned vaginal birth. California has reduced the rate of first-time unnecessary c-sections and has seen a reduction in their maternal mortality rate. 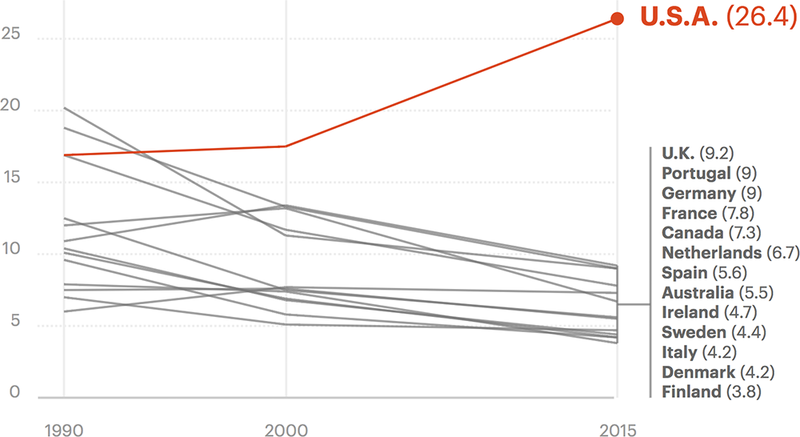 California is the only state to buck the trend of increasing maternal mortality rates. Lindsay Crosby, a 32-year-old mother from Connecticut died just days after giving birth to her third child. Doctors diagnosed her with Strep A, a bacterium often found in the throat and on the skin. By the time the mother of three was taken to the hospital, the bacteria had caused sepsis, the immune system’s deadly response to an infection that causes difficulty in breathing, low or no urine output and changes in mental status. When sepsis worsens, it can lead to septic shock, extremely low blood pressure and, eventually, organ failure or death. A gofundme has been set up for the family of Lindsay Crosby. NPR noticed some problems with medical care in general: unorganized hospital protocols for dealing with potentially fatal complications, allowing for treatable complications to become lethal; and some doctors entering the growing specialty of maternal-fetal medicine were able to complete that training without ever spending time in a labor-delivery unit. Hypertensive disorders of pregnancy, 6.8%. We may be doing too much, as opposed to too little. For example, not every country uses routine IV fluids during labor. A recent survey found that 62% of laboring women in the United States got a continuous “drip” intravenous fluids during labor. This is due to an outdated protocol that forbids laboring women to eat or drink. But restricting food and water is not evidence-based. And beyond that, the saline drip may not be as innocuous as we think. This study found that using a .9% saline solution rather than a balanced crystalloid increased the risk of major morbidity, including postoperative infection and renal dysfunction, in patients undergoing major open abdominal surgery. NPR investigated saline and balanced fluids, and noted many studies that found increased mortality and longer hospital stays among surgical patients receiving normal saline. Not only that, but continuous drips have had other negative health outcomes come to light: NPR reported on possible harmful effects of the chemicals that may leach out of the plastic IV bags and tubing, such as the plastic additive phthalates, used in medical equipment such as feeding tubes, breathing tubes and intravenous lines. The Wall Street Journal reported on an animal study showing that another chemical found in IV bags and tubing, cyclohexanone, can trigger health problems in the hearts and neurological systems of the rats that were exposed. About 61% of mothers had received an epidural in 2008 in the United States, whereas only 25% of women had epidurals in the United Kingdom. Most European countries have higher proportion of women using nitrous oxide for pain relief during labor than the United States. Only around 1% of hospitals in the US offered nitrous oxide to women in 2011. She was admitted to the hospital, but it was too late. 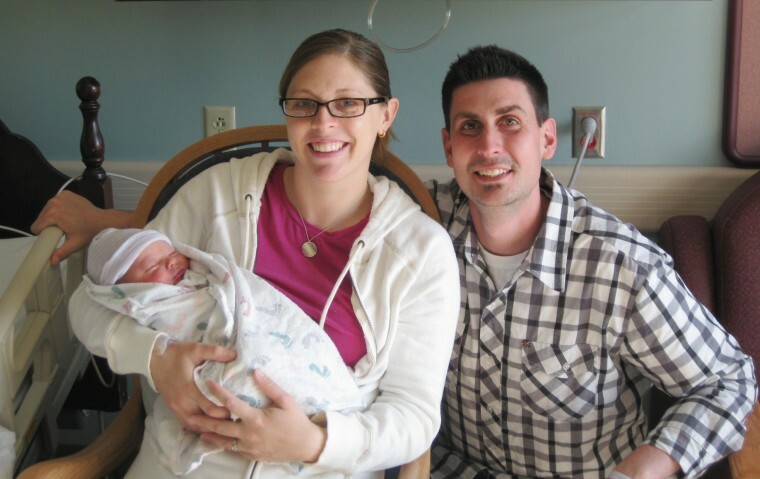 On March 31, 2011, six days after she gave birth, Hanson died from an infection. In Germany postpartum mothers get up to 14 visits from a nurse to their homes after they deliver for the first 6 weeks, and indefinite access if breast feeding. In Holland, all mothers are entitled to a kraamverzorger (a professional maternity nurse) for the first eight to ten days after giving birth, for six hours each day. A kraamverzorger assesses the well-being of the newborn, and also closely monitors the mother’s recovery process. She helps with breastfeeding, demonstrates newborn care, checks position of the uterus, and also helps with shopping, making lunch and doing light housework. In many parts of Latin America, they have a forty-day period knows as la cuarentena, meaning “quarantine”, where female relatives take on all domestic duties to ensure the new mother rests at home. A midwife also visits frequently during the first two weeks to check on baby and mother’s well-being. United States, on the other hand, has no such program in place. If parents want postpartum care, they can hire a doula that offers postpartum care, or give birth with a midwife that provides a more personal experience, including follow-up care. Thirty-year-old Crystle Galloway died just six days after a cesarean section in July, 2018. She was found unconscious by her mother, slumped over the bathtub with her lips swollen and drooling from the mouth. After paramedics were called and failed to take her vital signs her mother drove her to the hospital, where a CT scan revealed bleeding on her brain. The mother of three was quickly flown to Tampa General Hospital but slipped into a coma. She passed away three days shy of her 31st birthday, leaving behind three kids, including her newborn son. A gofundme is collecting donations for her family. Why can’t the USA get it through its GMO head that less is more? That birth is a normal process, and not an illness. Sweden, for example, only performs one ultrasound in nine months and no gynecological exams for most women. Their c-section rate is 16.4 percent of live births, which is half the United States. Their neonatal mortality is low, at 1.5 deaths per 1,000 — the second lowest in Europe behind Iceland — as is maternal death in childbirth, at 3.1 per 100,000 births. More than 40% of women give birth on some kind of antibiotic in the United States, whereas routine use of antibiotics during birth is not shared by European countries. Every little intervention adds up. Each individual risk is compounded together. Don’t blame it on the woman’s age. Don’t blame it on that she might have a chronic condition, or that she might be obese, or she might be a smoker. It’s not the mother’s fault. It’s everyone’s fault. It’s the doctor who schedules a c-section because a vaginal birth interrupts his vacation. It’s the doctor who schedules a repeat c-section when the woman could be eligible for a VBAC (vaginal birth after cesarean). It’s the doctor who comes in and catches the baby at the last minute. It’s IVs and epidurals and overuse of drugs as detailed in Business of Being Born. It’s the protocol that women go home 24 hours after birth yet not provide postpartum phone calls and home visits, like practically every other European country offers. It’s the nurse who might not catch the cries of a mother who says she doesn’t feel well. It’s the ER who might not be equipped to address a postpartum mother’s eclampsia or hemorrhage. It’s the short maternity leave. It’s the pressure to be on your feet when you should be resting. It’s the lack of support. It’s all of it. We should learn from our neighbors who have fewer women dying after birth, instead of wasting everyone’s time by blaming the mothers, or saying “we don’t know”. Next articleThinking of Getting the Shingles Vaccine?